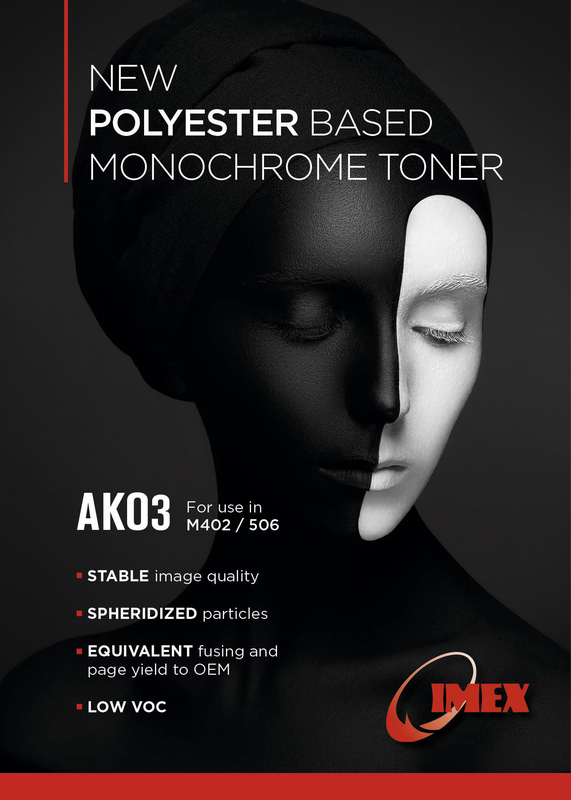 IMEX Group has released AKO3, a monochrome toner for use in HP Pro M402dn, 426fdn and HP Enterprise M507dn, MFP527fdn. This toner utilizes IMEX’s mechanical surface treatment technology and is Polyester based to mimic the physical properties of chemically-produced toner as used by OEM in its respective applications. AKO3 has been designed to achieve outstanding performance in regards of image density and page yield with low background, reduced OPC wear and excellent fusing on heavier papers and labels. Our toner AKO3 is LGA compliant due to the low VOC Polyester resin base. This product works very well with a variety of components and ensures trouble free performance to the highest quality level.